Look how low that midday curve got! This might be a one-time event, but it’s still an indication of how things are changing in the power system. 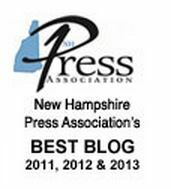 ISO-New England says that on April 21, mild weather and high solar output depressed daytime loads below those in the middle of the night for the first time ever in New England (although apparently this happens frequently in solar-filled California). On that day, NE-ISO says that at 1:30 p.m., distributed solar (meaning solar panels “behind the meter”, often on roofs) produced about 2,400 MW, which was one-fifth of the total electric need in the region at that moment. One-fifth! 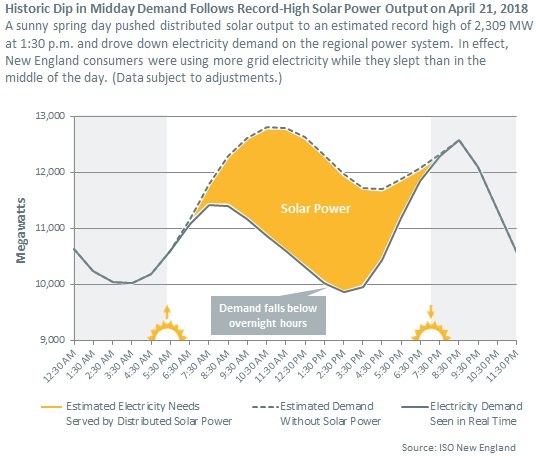 With over 5,800 MW of BTM solar power expected in New England by 2027, the ISO anticipates more occasions when demand may dip extremely low, particularly during the spring and fall. To more accurately anticipate solar output, the ISO is working with industry experts to build a day-ahead forecast of distributed solar generation that can be integrated into our existing load forecast models, for an improved forecast of system load. Additionally, negative pricing should help minimize times where there’s too much energy on the system, while 2017’s improved real-time fast-start pricing will help incentivize power resources that can respond quickly to ISO dispatch instructions. Note that April 21 was a Saturday, so industrial power usage would have been low.